Weather and water conditions suggest Arashi® Spinbaits – and anglers who fish them – could be major players this week in the Bassmaster Elite tournament on New York’s St. Lawrence River, a busy waterway on the U.S./Canda border. In similar conditions last August on New York’s Lake Champlain, Storm Pro Brandon Palaniuk boated a big share of his bass on a Spinbait en route to an impressive 3rd-place finish in the 109-angler field. Although similar in looks to a top-water prop bait, a Spinbait is counted down deep to tempt and catch suspended bass – notoriously the hardest fish to catch. But Spinbaits elicit bites from these finicky fish better than other deep-reaching baits. Acres upon acres of deep, clear water await Palaniuk in the St. Lawrence River, a fishery similar in many respects to Lake Champlain, where the Spinbait coaxed bites from half or more of the bass he caught. In such an environment – where bass can see your bait coming from far away – the Spinbait’s subtle action can be the difference between getting bites and coming up empty. The Spinbait boasts a unique 3-2 prop design – three blades up front, two in back – that imparts a vibration that anglers easily feel, ensuring an optimal slow retrieve speed that will maximize the lure’s action and stay in the strike zone. 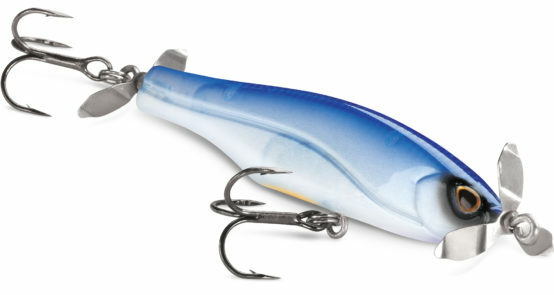 In addition to imparting vibration and subtle flash, counter-rotating props ensure the bait swims a straight path back to the boat. To catch deep-dwelling bass on a Spinbait like Palaniuk does, first use your sonar/GPS unit to determine the depth and some locations in which they are suspending. Waypoint those spots and rotate between them throughout the day. Before fishing each area, set up facing upstream and back off just shy of how far you can cast – remember, your boat is more likely to spook bass in clear water. Make a long cast just past where the bass are suspending and count down your Spinbait to the depth they are holding in. Reel in very slowly. “Those propeller blades are fine-tuned to spin at extremely low speeds, so you can swim it through really slow,” Palaniuk says. Throw Spinbaits with a medium/light-action rod on the lightest pound-test 100 percent fluorocarbon line you can – no heavier than 8-pound test, generally. “Too heavy a line will hinder the subtle action the bait is designed for,” Palaniuk explains. Rotated hook hangers, a feature of all baits in the Arashi line-up, ensure that the Spinbait’s two sticky-sharp No. 6 Premium VMC® black-nickel treble hooks will grab fish and not let go. Spinbaits measure 3 1/8 inches, weigh 1/3 ounces and come in 10 fish-attracting color patterns: Hot Blue Shad, Bluegill, Blue Back Herring, Wakasagi, Ghost Hitch, Ghost Pearl Shad, Green Gill, Pro Blue, Black Silver Shad and Green Gold Shad. Arashi (Ah-Rah-Shee) means “Storm” in Japanese. Storm is one of many respected names in the Rapala® family of brands.